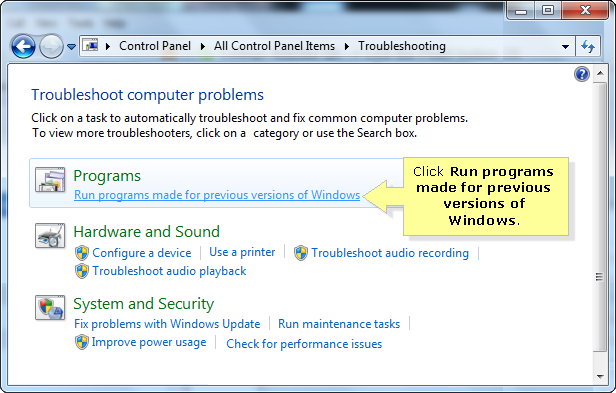 The compatibility issue of installed programs in a computer has been improved in Windows 7. 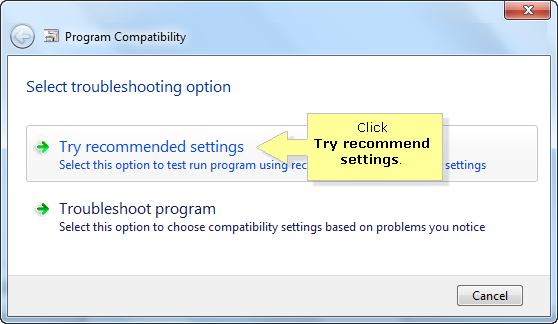 If you have an incompatible program in your computer, you can use it using the Program Compatibility feature in Windows 7. The steps below will guide you on how to use the Program Compatibility feature in Windows 7. If you are using Windows 8, click here. Click the Pearl icon and then click Control Panel. Click Find and fix problems under System and Security. Click Run programs made for previous versions of Windows under Programs. On the Program Compatibility window, click Next and the system will start scanning for a list of programs. Select the program and click Next. In this example, we are trying to ensure that the FileZilla program is compatible with Windows 7. NOTE: If the program is not in the list, select Not Listed and browse to the program file. NOTE: The system will automatically check for the previous version of the program. Click the button then click Next. You should now be able to use the program. Click Yes, save these settings for this program and then exit the Program Compatibility window. The Program Compatibility settings only apply to the software you have specified to run it with. You will need to run the Program Compatibility feature again if you have other installed programs that are incompatible with your Windows 7 operating system. For programs that are incompatible with Windows 7 64-bit operating system, you will need to download the driver.